Our comprehensive anniversary gift guide is here to help you and your loved ones celebrate wedding anniversaries with thoughtful gifts for every happy year of marriage! 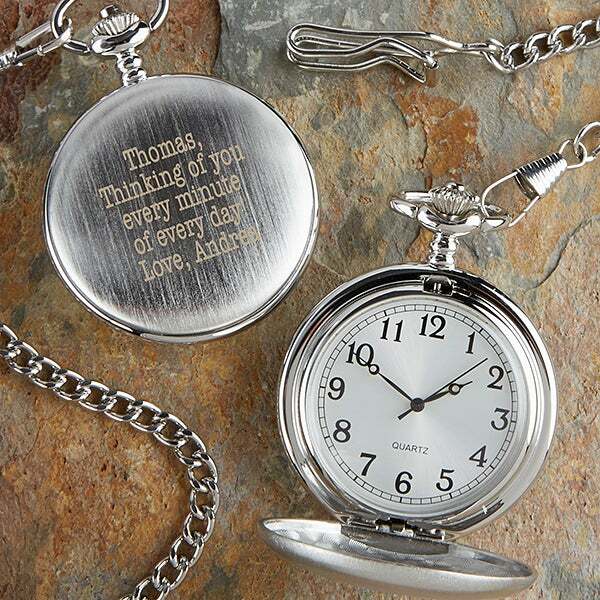 Learn about symbolic anniversary gifts and their meaning for every year -- year 1 through 60 -- so you can find the perfect gift every time. What Is The Best Gift For Anniversary? The best anniversary gifts don't have to be expensive or extravagant, but they should be meaningful. 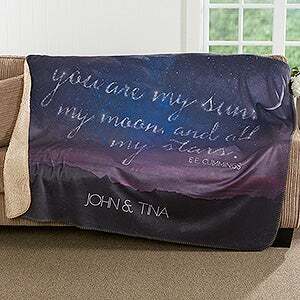 Wow your partner with a heartfelt present that has a hidden message that only the two of you share. Or surprise your mom and dad or another couple with a gift they'll remember and cherish for many years. Discover anniversary gift ideas for him, for her, and for parents or couples. 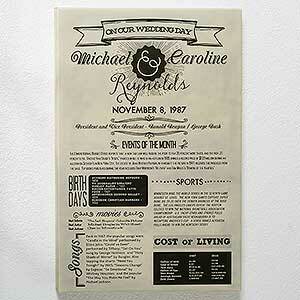 Browse gift suggestions by recipient or by the anniversary year with traditional and modern anniversary gift themes. What Are The Anniversary Gifts For Each Year? Today, the traditional and modern anniversary gift lists are widely recognized and followed, dictating a theme for each anniversary by year. Many of these gift themes have evolved over hundreds and even thousands of years. In addition to the traditional and modern anniversary gifts there are symbolic wedding anniversary colors, flowers, jewelry and gemstones associated with each year, which can further guide your gift selections and help you plan anniversary celebrations. 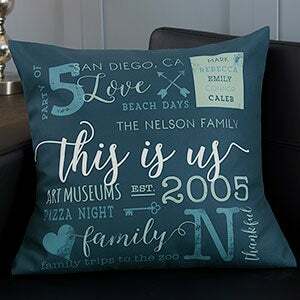 For each year, we list the traditional and modern gift theme and symbols and offer suggestions for unique anniversary gifts for her, for him, for parents and for other couples celebrating their anniversaries. Gift Ideas For Him: A set of love coupons. Tickets to a concert or sporting event. 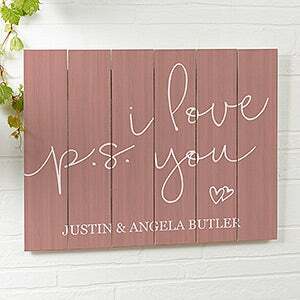 Gift Ideas For Her: Write a love letter or frame your wedding vows. A gold necklace. Gift Ideas For Couples: A framed art print or a set of personalized stationery. Custom engraved clock. 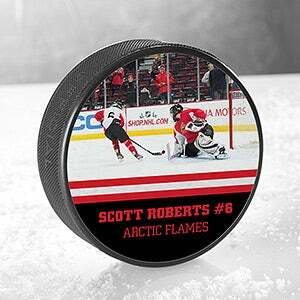 Gift Ideas For Him: Custom canvas print. Egyptian cotton sheets and personalized pillowcases. Gift Ideas For Her: A luxury cotton robe or a set of monogrammed towels. Garnet earrings. Gift Ideas For Couples: China platter, tray or serveware to match their wedding china. Gift Ideas For Him: Leather jacket. 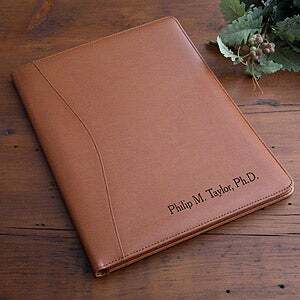 A leather journal or portfolio. 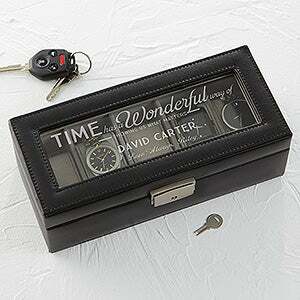 Personalized leather watch box. Gift Ideas For Her: Leather handbag. A leather charm bracelet or a pearl necklace. 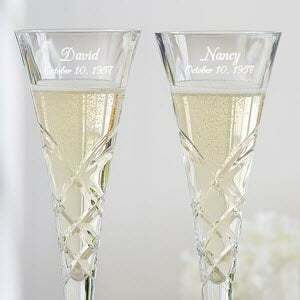 Gift Ideas For Couples: Engraved glass ice bucket or etched crystal champagne flutes. Gift Ideas For Him: Espresso machine. Custom garden tote with garden tools. Plant a flowering tree in the yard. Gift Ideas For Her: A bouquet of her favorite flowers. A blue topaz pear shaped ring. Gift Ideas For Couples: Fruit basket. Potted hydrangeas or the couples' favorite flowers in a personalized vase. 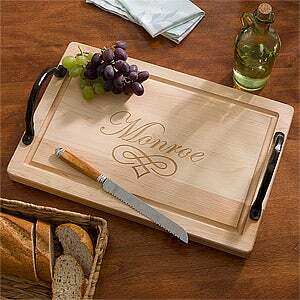 Gift Ideas For Him: A custom engraved wood grilling cutting board. Cherry wood cigar humidor. Gift Ideas For Her: A rustic wood and slate cheese board. Sapphire stud earrings. Gift Ideas For Couples: A vintage silverware set. 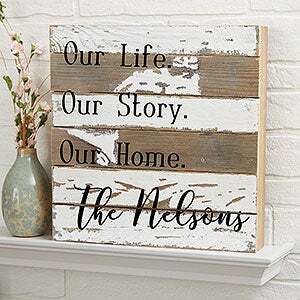 A personalized reclaimed wood sign. Gift Ideas For Him: A set of new golf clubs. A personalized jar with his favorite candy. Gift Ideas For Her: Engraved wood jewelry box. Amethyst pendant necklace. 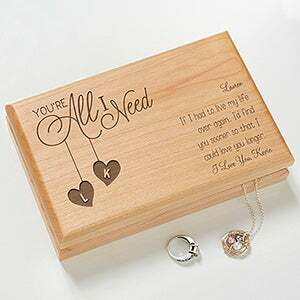 Gift Ideas For Couples: A wooden keepsake box. A box of exotic sweets. 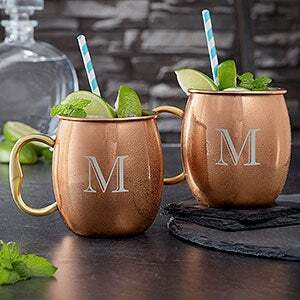 Gift Ideas For Him: A set of custom Moscow mule copper mugs. A cashmere sweater. Gift Ideas For Her: Embroidered wool blanket. A wool winter coat. Black onyx bracelet. Gift Ideas For Couples: Copper yard sculpture. 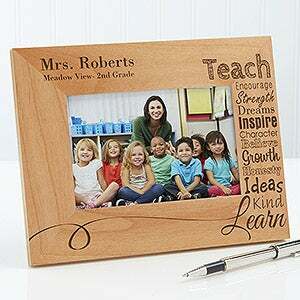 A personalized gift for their desk or office. Gift Ideas For Him: Custom bronze bracelet or key chain. A smartwatch with bronze details. Gift Ideas For Her: Artistic handmade pottery. Bronze and pink tourmaline ring. 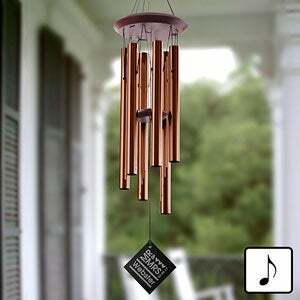 Gift Ideas For Couples: Engraved bronze wind chimes. A set of personalized ceramic bowls. Gift Ideas For Him: Monogrammed leather toiletry case. A cricket set made of willow. Gift Ideas For Her: Wicker chair. A ceramic watch or lapis lazuli bracelet. 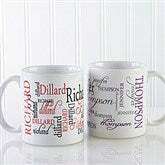 Gift Ideas For Couples: A set of custom coffee mugs. A picnic basket filled with gourmet goodies. Gift Ideas For Him: Personalized aluminum house plaque. Antique tin collectables. 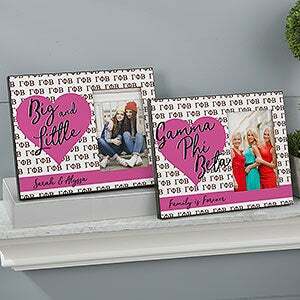 Gift Ideas For Her: Custom aluminum metal photo panel. Diamond bracelet. Gift Ideas For Couples: A tin filled with gourmet treats. Aluminum serving bowl. Gift Ideas For Him: Stainless steel outdoor grill. A vintage steel or pewter tankard. Gift Ideas For Her: Stainless steel cocktail shaker and bar tool set. Silver and turquoise necklace or bracelet. 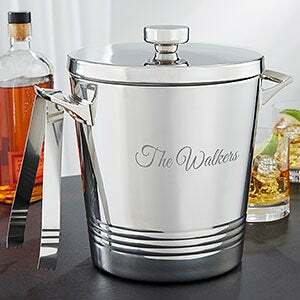 Gift Ideas For Couples: Personalized stainless steel cooler tub or ice bucket. Stainless steel knife set. Gift Ideas For Him: A silk tie and matching pocket square. A silk robe or silk pajamas. Gift Ideas For Her: A silk robe, nightgown or a silk scarf. Carved jade bracelet or a string of pearls. 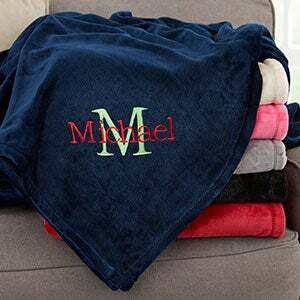 Gift Ideas For Couples: Monogrammed linen towel set. 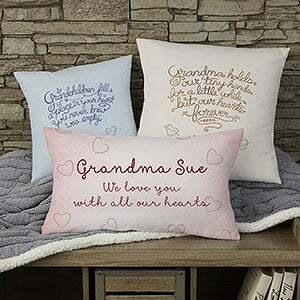 A personalized linen pillow. Gift Ideas For Him: A new suit or jacket with faux-fur trim. A pair of sneakers with no-tie shoe laces. Gift Ideas For Her: A lace dress or lace lingerie. Filigree lace jewelry. A citrine and diamond ring. Gift Ideas For Couples: A lace tablecloth or table runner. 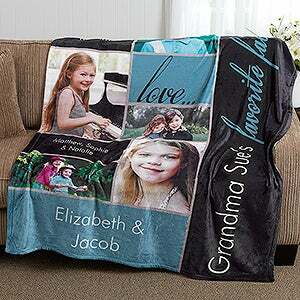 A custom photo blanket or photo pillows. Gift Ideas For Him: A gold watch or gold cuff links. Faux ivory carved chess set. Gift Ideas For Her: Faux ivory carved jewelry. Gold and opal earrings. Gift Ideas For Couples: Decorative elephant sculpture. Ivory colored tea set. Gift Ideas For Him: A personalized watch box. A custom engraved watch. Gift Ideas For Her: Swarovski crystal watch or brooch. Ruby heart pendant. 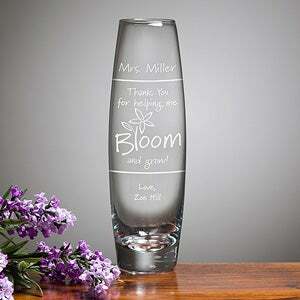 Gift Ideas For Couples: Engraved crystal vase or crystal ice bucket. A set of personalized crystal wine glasses. 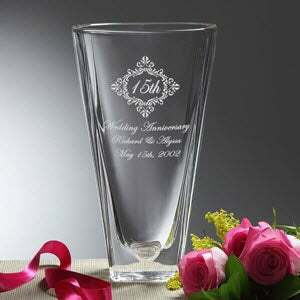 After the 15th year, only milestone anniversaries occurring every 5 years have traditional gift symbols and meanings. The years in between are recognized with an anniversary theme. Gift Ideas For Him: A glass teapot and tea infuser. An assortment of exotic teas. Gift Ideas For Her: A new espresso machine or a French press. A sampling of gourmet coffee. Gift Ideas For Couples: A silver sugar bowl and creamer set. Custom etched glass coffee mugs. Gift Ideas For Him: Monogrammed whiskey decanter. A set of whiskey glasses and rocks ice cubes. Gift Ideas For Her: Custom stemless wine glasses and a set of wine charms. Personalized wine bottle. 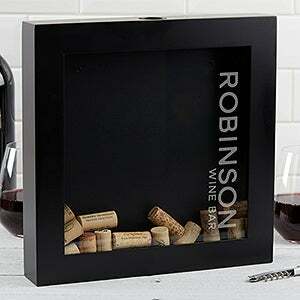 Gift Ideas For Couples: Personalized wine accessory kit. Wine cork shadow box. Gift Ideas For Him: Juicer or blender. Bread maker or smokeless electric grill. Gift Ideas For Her: Kitchen Aid stand mixer, new slow cooker or waffle maker. A vintage porcelain tea set. 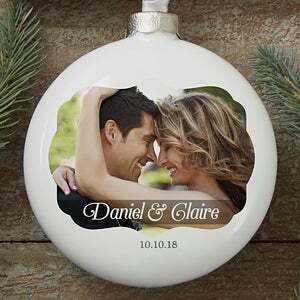 Gift Ideas For Couples: Personalized porcelain photo ornament with a recent photo or their wedding photo. Gift Ideas For Him: Dinner out at a Chinese restaurant. A bronze Buddha sculpture. Gift Ideas For Her: A bonsai jade tree. A romantic trip to the beach. Gift Ideas For Couples: Bronze statue for their garden. 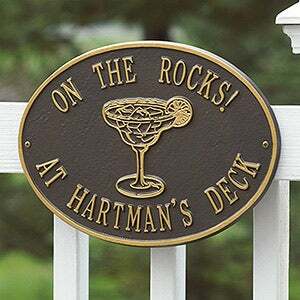 A personalized bronze outdoor plaque. 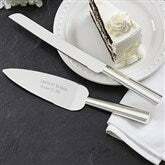 Gift Ideas For Him: Chef’s quality platinum knife set. Platinum ring. 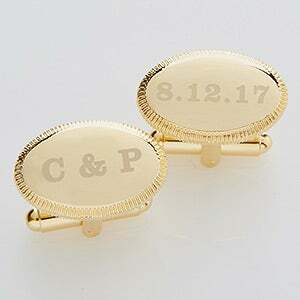 Engraved platinum cuff links. Gift Ideas For Couples: A classic china tea set. Porcelain serving dishes or a personalized platter. Gift Ideas For Him: An outdoor fire pit. 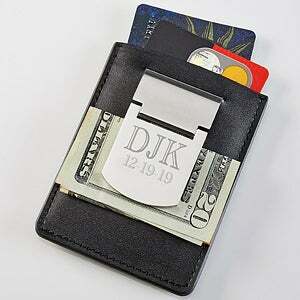 Monogrammed nickel money clip. Tickets to a Jazz concert. Gift Ideas For Her: Scented candles or a decorative glass lantern. A weekend away at Fire Island in New York. 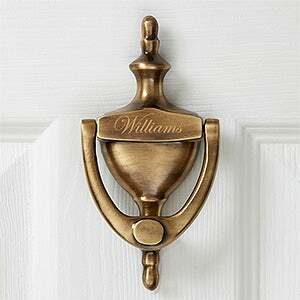 Gift Ideas For Couples: A custom brass or nickel doorknocker. A gift card to a hibachi restaurant. Gift Ideas For Him: A weekend whitewater rafting or fishing. Copper water bottle. Gift Ideas For Her: A visit to an aquarium or a dinner on a riverboat. Copper cookware set. Gift Ideas For Couples: A copper garden fountain. 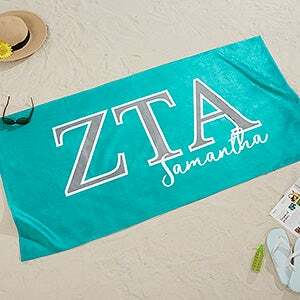 Personalized beach towels or a beach tote for their water adventures. Gift Ideas For Him: An adventure trip skydiving or hang gliding. 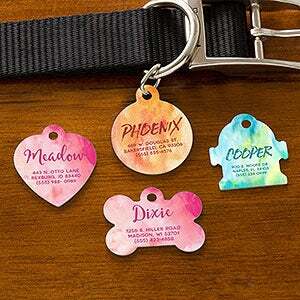 A personalized silver-plated keychain with a special message. Gift Ideas For Her: A ride in a hot air balloon or helicopter. Engraved silver-plated photo album. 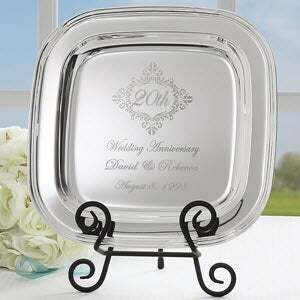 Gift Ideas For Couples: A personalized silver anniversary plate. A set of personalized wind chimes. 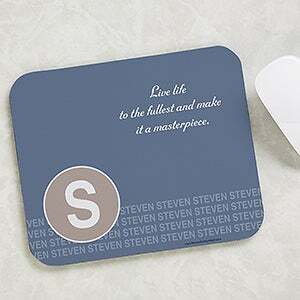 Gift Ideas For Him: Personalized tumbled stone coasters. New stereo or a set of new speakers. 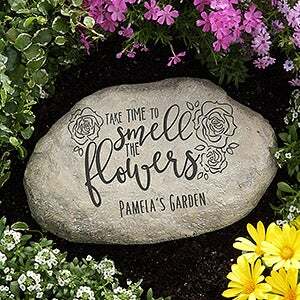 Gift Ideas For Her: Personalized garden stone. Amazon Echo or Google Home smart speakers. Gift Ideas For Couples: Tickets to a concert, symphony orchestra or opera. Gift Ideas For Him: Heirloom silver tie pin or tie bar. A vintage silver pocket watch. 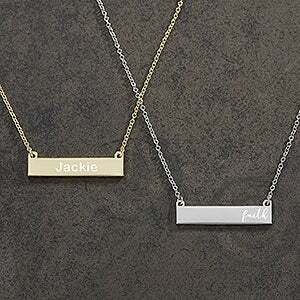 Gift Ideas For Her: Engraved silver bar necklace or vintage silver locket pendant. Three stone diamond ring. 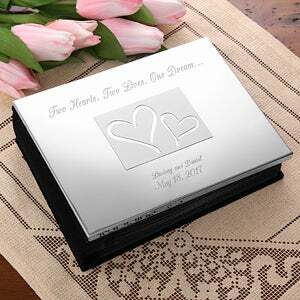 Gift Ideas For Couples: Engraved silver picture frame. Anniversary announcement in the local paper. 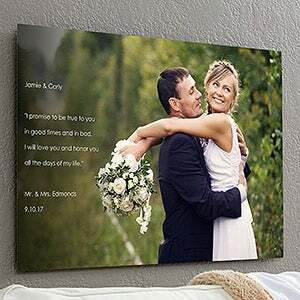 Gift Ideas For Him: Your favorite wedding photo printed on a ChromaLuxe metal panel or canvas print. A new digital camera. Gift Ideas For Her: A visit to a local art museum or gallery. A custom commissioned portrait or photo shoot. Gift Ideas For Couples: An original art print, painting or framed photography print. 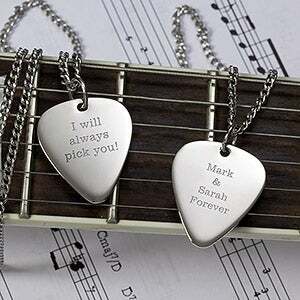 Gift Ideas For Him: A custom engraved guitar pick pendant. A personalized ticket album to hold all of his music concert ticket stubs. Gift Ideas For Her: A playlist with her favorite songs from your wedding. A handmade carved wood sculpture. Gift Ideas For Couples: Tickets to a music festival. A romantic couples sculpture. Gift Ideas For Him: Linen shirt or tie. 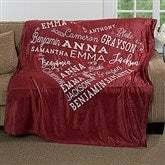 Personalized throw pillow or blanket. Gift Ideas For Her: Potted orchids in her favorite color. A trip to a botanic garden or the National Orchid Garden in Singapore. 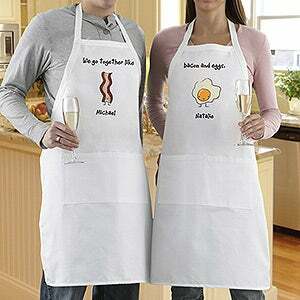 Gift Ideas For Couples: Personalized kitchen towels and coordinating apron set for two. Gift Ideas For Him: Engraved multi-tool hammer set or pocket knife. New cordless drill, circular saw or another handy tool he might be missing. Gift Ideas For Her: Garden tools and tote. New bedroom or living room furniture. 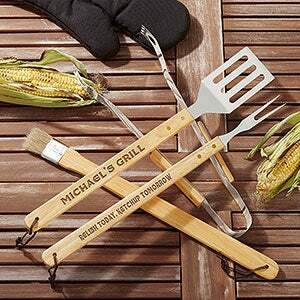 Gift Ideas For Couples: Personalized BBQ grilling utensil set. Vintage or unusual piece of furniture. Gift Ideas For Him: A watch or cuff links with mother of pearl details. Steak knife set with mother of pearl handles. Gift Ideas For Her: Custom multi-colored pearl necklace. A diamond bracelet. Mother of pearl jewelry box. Gift Ideas For Couples: Mother of pearl inlay mirror, vase or other home décor accents. Gift Ideas For Him: A wristwatch with a compass. A personalized garment bag, duffel bag or travel case. Gift Ideas For Her: Embroidered weekender travel bag. Monogrammed cosmetic bag, shoe bag or lingerie bag. A custom photo watch. 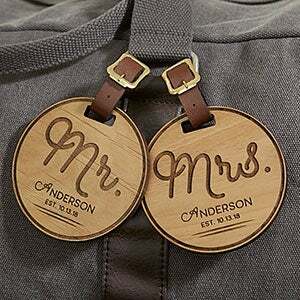 Gift Ideas For Couples: A set of personalized luggage tags. New luggage set. Gift Ideas For Him: Bronze cuff links, tie bar or jewelry. Personalized travel accessory box or leather toiletry bag. Gift Ideas For Her: Embroidered travel tote or monogrammed purse hanger. Custom engraved compact mirror and lipstick case. 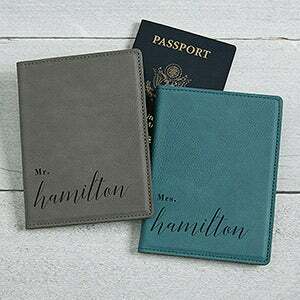 Gift Ideas For Couples: Personalized passport holders. 1,000 Places To See travel book. Gift Ideas For Him: Custom golf club covers for his irons. A cast iron skillet or grilling pan. Gift Ideas For Her: Old fashioned cast iron waffle iron. 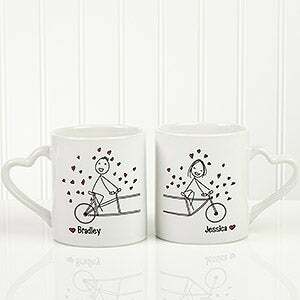 A set of personalized mugs on an iron stand. Indoor strawberry garden. Gift Ideas For Couples: Personalized maple wood server with iron stand or cutting board with iron handles. Gift Ideas For Him: Candlelit dinner at home with his favorite home cooked meal. Personalized butcher-block cutting board. Gift Ideas For Her: Dinner out at her favorite restaurant. Personalized recipe box with custom recipe cards. 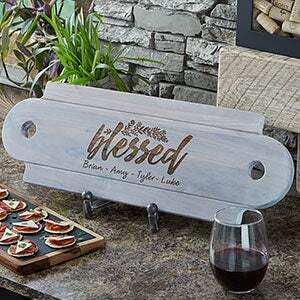 Gift Ideas For Couples: Personalized wood & slate cheese board, cutting board or wooden cooking utensils. Gift Ideas For Him: Carved jade desk accessory. Fossil coral bookends, desk clock or other office gift. Gift Ideas For Her: A second honeymoon with a visit to a coral reef. Coral or jade jewelry. Gift Ideas For Couples: Personalized wall décor or home décor accents in coral or jade. Gift Ideas For Him: Antique sign for his bar or workshop. Antique crystal whiskey decanter. 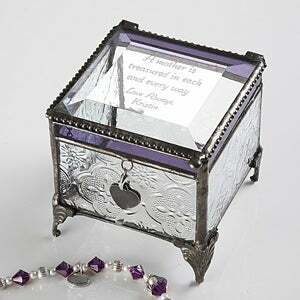 Gift Ideas For Her: Antique piece of jewelry in a personalized vintage jewelry box. Antique cameo pin. Gift Ideas For Couples: New or antique bone china tea service set with a rose motif. Personalized bone china anniversary plate. Gift Ideas For Him: First edition of a book by his favorite writer. Personalized journal. Gift Ideas For Her: Custom photo book with her favorite family or vacation photos. Personalized silver-plated bookmark. 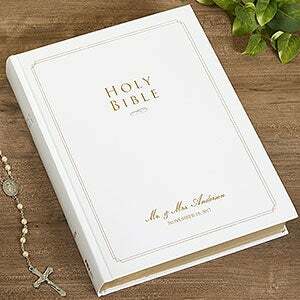 Gift Ideas For Couples: A personalized keepsake bible they can pass down to their kids or grandkids. Gift Ideas For Him: A personalized silver fortune cookie with a special message inside. A carved elephant with his trunk pointing up. Gift Ideas For Her: Lucky money tree. A lucky charm, like a horseshoe, wishbone, four-leaf clover or elephant. Gift Ideas For Couples: A personalized four-leaf clover sun catcher. A set of personalized mugs with four-leaf clovers. Gift Ideas For Him: A coffee mug, t-shirt or poster with a funny saying. A book of jokes or a funny card game. Gift Ideas For Her: Personalized lace handkerchief. Wine glasses with funny sayings. Dinner and a date to see a romantic comedy. Gift Ideas For Couples: Tickets to a comedy club. A DIY gag gift to make the couple laugh. Gift Ideas For Him: A bottle of fine red wine. 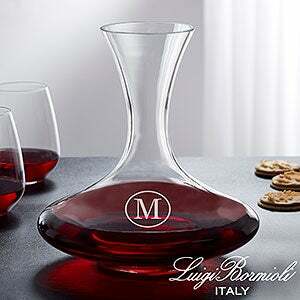 A custom engraved wine decanter. Tie pin or tie bar with a ruby gemstone. Gift Ideas For Her: A romantic trip to a vineyard. A heart-shaped ruby and diamond necklace. Gift Ideas For Couples: A bouquet of 40 red roses. 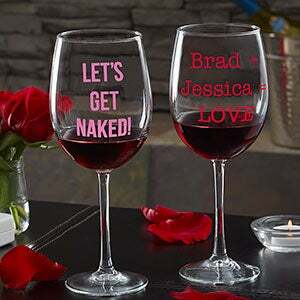 A set of personalized red wine glasses. Gift Ideas For Him: Personalized portfolio and pen. A new monitor, keyboard and mouse for his office. Gift Ideas For Her: Personalized journal or stationery set. A new laptop or tablet for her desk. 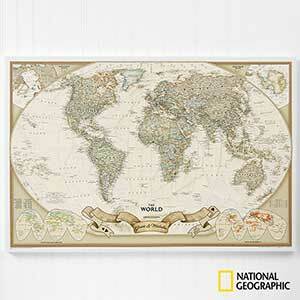 Gift Ideas For Couples: Personalized romantic travels National Geographic U.S. or World canvas map for their home office. Gift Ideas For Him: Personalized watch or leather watch storage box. 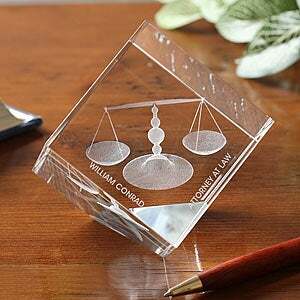 Engraved desk clock for his office. 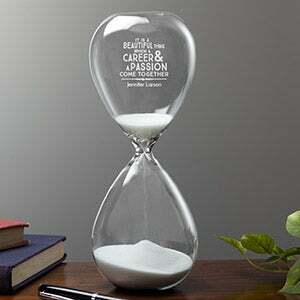 Gift Ideas For Her: Heart-shaped engraved desk clock. A vacation home or timeshare in her favorite travel destination. Gift Ideas For Couples: Personalized clock commemorating the couple's anniversary. 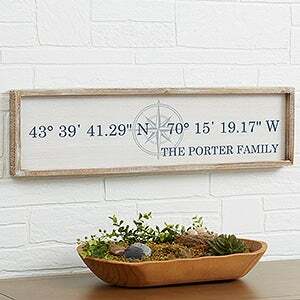 Personalized wall sign with the latitude and longitude coordinates of their home. Gift Ideas For Him: A new big screen TV. Leather travel accessory bag, grooming travel set or a new duffel bag. Tickets to a Broadway show. 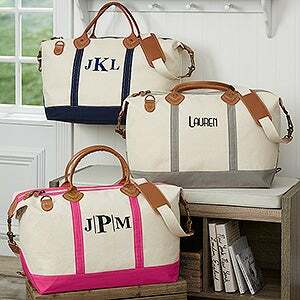 Gift Ideas For Her: Personalized weekender travel bag with matching handbag. A vacation to a new destination she has always wanted to visit. Gift Ideas For Couples: Tickets to the movies, theater, concert or a comedy show. Gift Ideas For Him: A smartwatch, new headphones, soundbar or a wireless speaker. A package of Omaha steaks or gourmet baked goodies. Gift Ideas For Her: A new e-reader, smart thermostat or a Roomba robot vacuum. A box of gourmet chocolates or samples of gourmet coffee. 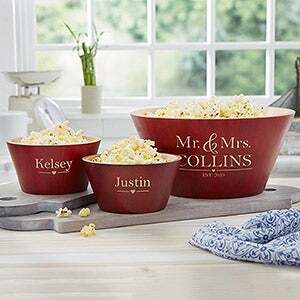 Gift Ideas For Couples: Personalized popcorn bowl with a sampling of gourmet popcorn. A homemade basket with gourmet treats.. Gift Ideas For Him: A bottle of Bombay Sapphire gin with a set of blue crystal drink glasses. Tickets to a Blues Fest. Gift Ideas For Her: A tropical cruise trip on the blue ocean. A sapphire and diamond ring or bracelet. 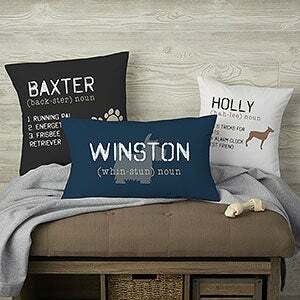 Gift Ideas For Couples: Personalized blanket or throw pillow that lists the couple's important life moments. Gift Ideas For Him: A poker table or a portable poker set. A slot machine for his man cave or home bar. A new video game console. A date at a poetry club. Gift Ideas For Her: First edition of her favorite poet’s book. A vintage set of her favorite board games. 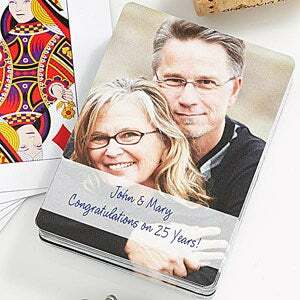 Gift Ideas For Couples: Custom photo playing cards and a personalized card box. Gift Ideas For Him: A Kindle or another e-reader. A set of cordless garden maintenance tools. Gift Ideas For Her: A succulent terrarium. A set of garden tools in a personalized garden tote. 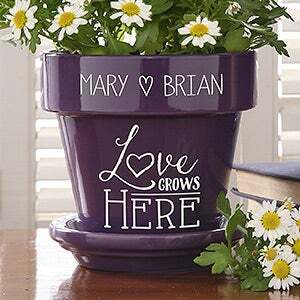 Gift Ideas For Couples: Personalized flowerpots filled with Camellias or their favorite blooms. A personalized garden flag or garden stake. Gift Ideas For Him: Garage workshop or home bar renovation. Vintage magnifying glass. Gift Ideas For Her: Kitchen, master bathroom or another home improvement renovation. A set of designer sunglasses. 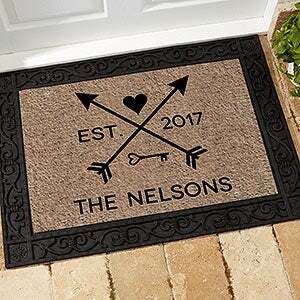 Gift Ideas For Couples: Personalized doormat. 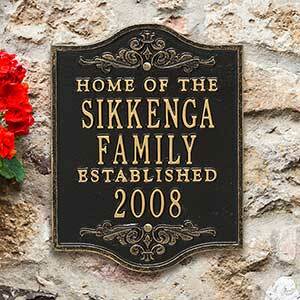 Personalized wall art or custom home décor accents. Gift Ideas For Him: Copper home bar accessories. Italian leather shoes. A fine bottle of Cognac. 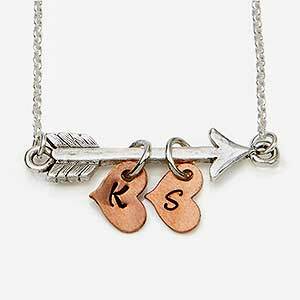 Gift Ideas For Her: Stamped copper necklace. A designer leather handbag or high-quality watch. A bottle of expensive perfume. Gift Ideas For Couples: A house plaque made of copper. A bottle of champagne and a box of decadent chocolates. Gift Ideas For Him: A trip to the Gold Coast. Engraved gold watch. A gold monogrammed signet ring. 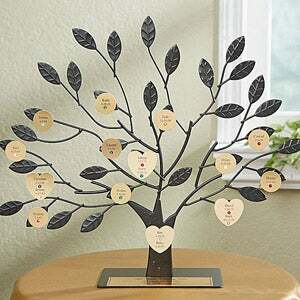 Gift Ideas For Her: Custom gold family tree keepsake. A rose preserved in gold. A gold and diamond eternity ring. Gift Ideas For Couples: A bouquet of 50 yellow roses. Request a greeting from the White House. 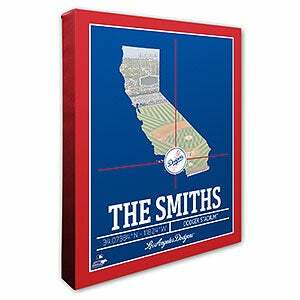 Gift Ideas For Him: A custom photo desk cube or collage canvas print. Photo coffee mug or travel mug. A vintage camera. 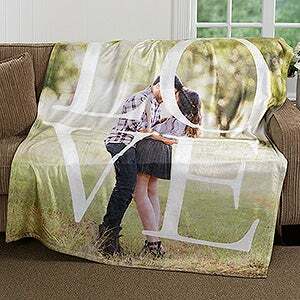 Gift Ideas For Her: A custom photo blanket or photo accent pillows. A new digital or instant camera. 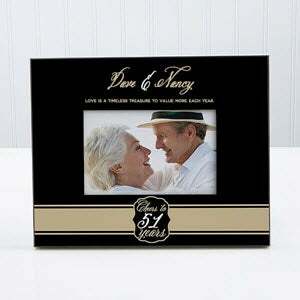 Gift Ideas For Couples: Personalized anniversary picture frame. A new custom photo piece for their puzzle piece wall décor. Gift Ideas For Him: A spa basket for men. A session for two at a salt cave spa or float tank. Couple's massage or mud treatment. 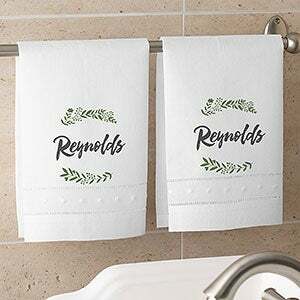 Gift Ideas For Her: A set of coordinating personalized bath accessories. A romantic weekend retreat for two at a spa or a day of pampering at home. 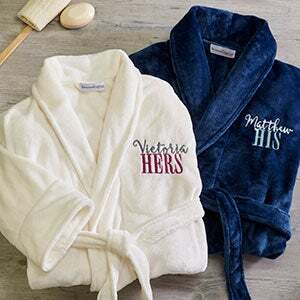 Gift Ideas For Couples: Personalized his & hers luxury robes. A set of monogrammed bath towels and soap set. Gift Ideas For Him: Designer sunglasses. Recycled vinyl record clock or wall art. A romantic weekend getaway at a nearby golf resort, vineyard or lake. 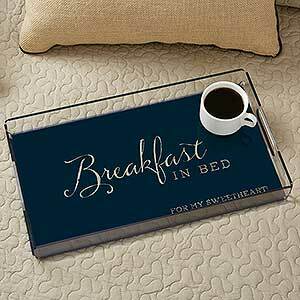 Gift Ideas For Her: Personalized acrylic serving tray for serving breakfast in bed. A romantic getaway or cruise to a tropical location. Gift Ideas For Couples: A gift card to their favorite restaurant. 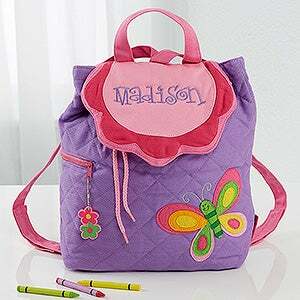 Personalized garment bags or weekender bags. Gift Ideas For Him: Personalized Pilsner beer glasses or beer mugs. A set of etched old fashioned glasses. 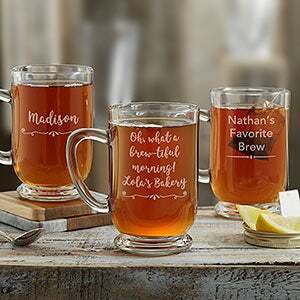 Gift Ideas For Her: Personalized mason jar cocktail glasses or stemless wine glasses. Engraved captain's wine decanter. 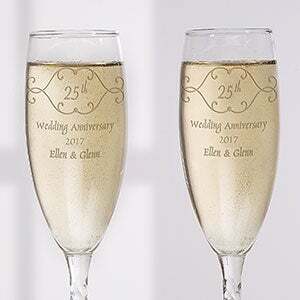 Gift Ideas For Couples: Custom engraved cocktail coupe glasses or stemless champagne flutes. Set of monogrammed glass coasters. Gift Ideas For Him: A vacation at a golf resort and spa. A new set of golf clubs. Gift Ideas For Her: A romantic trip to the Emerald Isle (Ireland) or the Emerald City (Seattle). Emerald bracelet. Gift Ideas For Couples: A personalized anniversary chronicle canvas print listing events and details from the day they were married. Gift Ideas For Him: A day on the golf course or fishing on a lake. A brunch or lunch date at a nice restaurant. Breakfast in bed. Gift Ideas For Her: A day trip to antique shops, a botanic garden or state park. 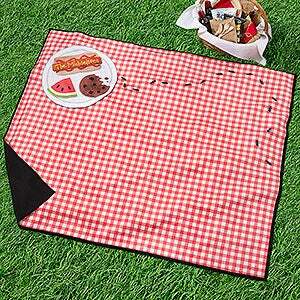 A personalized picnic blanket or a picnic basket and a picnic at the park. Gift Ideas For Couples: A potted box plant or a wooden succulent box planter. A framed photo from their wedding day. Gift Ideas For Him: A weekend in Las Vegas. A night out to a jazz or blues club, or his favorite restaurant. An evening of stargazing by the fire. 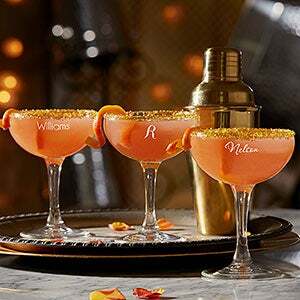 Gift Ideas For Her: A night on the town with dinner, dancing and late night dessert. A personalized Sherpa blanket perfect for a night of cuddling by the fire. Gift Ideas For Couples: A personalized night light. A gift basket with date night essentials: a gift card to the movies, restaurant and a bottle of wine. Gift Ideas For Him: A personalized pocket token with the words "faith, hope & love." A custom maple wood cutting board or fillet board. 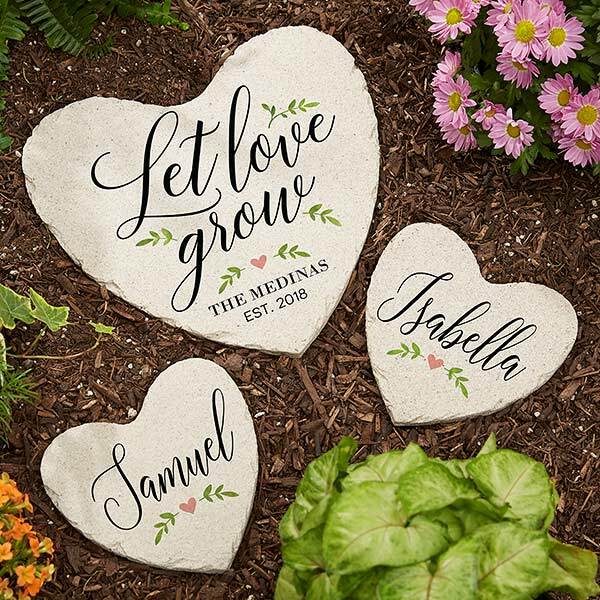 Gift Ideas For Her: A personalized garden stone with the words "faith, hope & love." A custom engraved pepper mill made from New England maple wood. 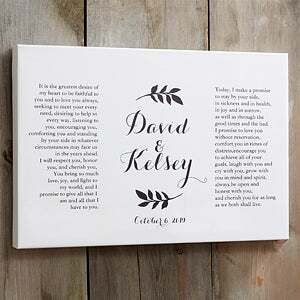 Gift Ideas For Couples: A personalized family bible or wall cross with an anniversary blessing for the couple. A maple tree to plant in their garden. Gift Ideas For Him: Support a charity he cares deeply about. Plant a tree through the Arbor Day Foundation and commemorate it with a personalized garden stone. Gift Ideas For Her: Take a day to volunteer together for a meaningful charity. Support a local animal rescue or sponsor an animal at a nearby zoo. 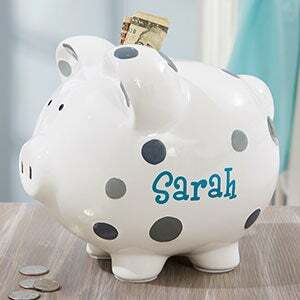 Gift Ideas For Couples: Give to a charity in the couple’s name. A gift basket with a sampling of sweet and savory olive oils and balsamic vinegars. Gift Ideas For Him: Matching diamond watches for him and her. A vacation to your honeymoon destination. Gift Ideas For Her: A personalized crystal champagne flute set. Diamond earrings. Gift Ideas For Couples: Request a greeting from the White House. Anniversary announcement in the local paper. What Does Each Wedding Anniversary Mean? The symbols chosen to represent wedding anniversary years offer deeper meaning for the couple's relationship. Some believe the symbols were chosen to bring good fortune, while others argue that they represent the strength of the marriage, hence the first anniversary is paper and the 60th is diamonds. The tradition of giving themed anniversary gifts by year dates all the way back to the Middle Ages. Although the history is a bit fuzzy, there is evidence of husbands giving their wives silver and gold on their 25th and 50th wedding anniversaries. The custom really picked up in the early 20th century with both the traditional and modern gift lists becoming well documented and followed in the United States, United Kingdom and other parts of Europe. Remember that the gift lists merely offer suggestions and a fun way to celebrate each passing year of marriage. They're not set in stone and the best anniversary gift is one that comes from the heart. 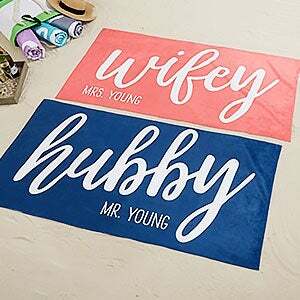 Shop our entire selection of unique and meaningful Anniversary Gifts for her, for him and for parents and couples.